MONDAY, Oct. 3, 2016 (HealthDay News) -- Conventional wisdom says too much salt is bad because it can lead to high blood pressure. And now a new 25-year study finds that salt -- even just a bit -- may increase your risk of premature death. The research found that if you normally have about 1.5 teaspoons of salt daily, adding just slightly less than a half teaspoon (1,000 milligrams) more a day can increase your odds of dying early by 12 percent. And, the risk continues to climb 12 percent for each 1,000 milligrams of salt you add to your daily diet. There was a potential bit of good news from the study, however. Cutting back on your salt consumption may extend your life. The study showed that restricting salt seemed to lower the risk of dying prematurely by 15 percent. However, this finding didn't reach statistical significance, the researchers said. "Consuming lower levels of sodium, as advocated by the American Heart Association and the U.S. Dietary Guidelines, will lead to lower blood pressure, lower risk of cardiovascular disease and lower subsequent mortality," said lead researcher Nancy Cook. She's a professor of epidemiology at the Harvard School of Public Health in Boston. Specifically, Cook's team found that over 24 years, people who consumed less than 1 teaspoon (2,300 mg of salt a day) had a 25 percent lower risk of dying, compared with those who consumed almost 1.5 teaspoons (3,600 mg/day). The American Heart Association (AHA) says that the average American consumes 3,400 mg of salt a day. "Much of the sodium we consume is found in processed food," Cook said. "The FDA [U.S. Food and Drug Administration] has now recommended a gradual reduction in sodium content in many such foods, which should lead to lower rates of hypertension as well as cardiovascular disease and deaths," she said. The report was published Oct. 3 in the Journal of the American College of Cardiology. The AHA currently recommends no more than 2,400 mg of salt daily. But, for optimal heart health, the AHA suggests no more than 1,500 mg of salt each day. The link between salt intake and death has been controversial, Cook said. It seems it's accepted now that high salt can have adverse effects, "but whether very low sodium levels are beneficial is less well accepted," she said. It's known that reducing salt helps lower blood pressure, but whether that translates to a reduction in heart disease and death is less clear, Cook said. While this new study didn't prove cause and effect, it "found a direct relationship of sodium intake with later mortality over 20 years of follow-up," she said. That means those with the lowest salt intake seem to have the lowest odds of dying early. She also pointed out that this study included healthy men and women who didn't have high blood pressure (hypertension) or heart disease. That meant there was less potential bias from these factors, Cook explained. "Our results found the lowest mortality among those consuming the lowest levels of sodium, and we believe they are more accurate than results from other studies," she added. For the new research, the investigators included two studies in which participants were either counseled on reducing how much salt they ate or were left to eat as much as they wanted. These studies -- Trials of Hypertension Prevention I and II -- were designed to see if reducing salt could prevent high blood pressure. Salt intake was measured with regular urine samples. There were 744 people in the phase 1 trial and nearly 2,400 people in the phase 2 trial who restricted their salt intake. Two hundred and fifty-one people in the salt-restriction group died during the study. Among nearly 3,000 people who weren't asked to restrict their salt, 272 died, Cook's team found. The first trial was conducted from 1987 to 1990 and the second from 1990 to 1995. Samantha Heller is a senior clinical nutritionist at NYU Langone Medical Center in New York City. She said, "We do not eat single minerals or single vitamins -- we eat food. So a diet that is very high in salt is likely due to a dietary pattern." The Western diet is loaded with prepared, frozen, junky, highly processed, poor-quality foods, laden with added salt, Heller said. "These kinds of diets raise the risk of heart disease, high blood pressure, cancer, diabetes, obesity and other diseases for many reasons, including the fact that they are high in salt," she said. The authors of an accompanying journal editorial said this study and previous ones "support modest reductions in sodium intake among persons consuming high-sodium diets," along with a healthy diet. 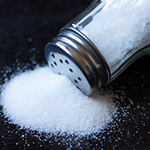 The editorial authors, Andrew Mente of McMaster University in Ontario and colleagues, also called for a randomized, controlled clinical trial of a low- versus moderate-intake salt diet to get a clearer idea of how salt consumption affects death risk.